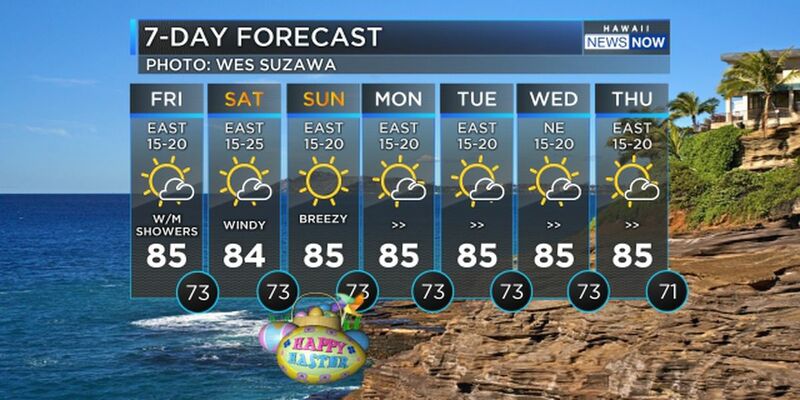 HONOLULU (HawaiiNewsNow) - We will enjoy moderate trade winds in the forecast. Rain showers will be limited for much of the week. On Wednesday, an approaching front will producing light winds just before its arrival. 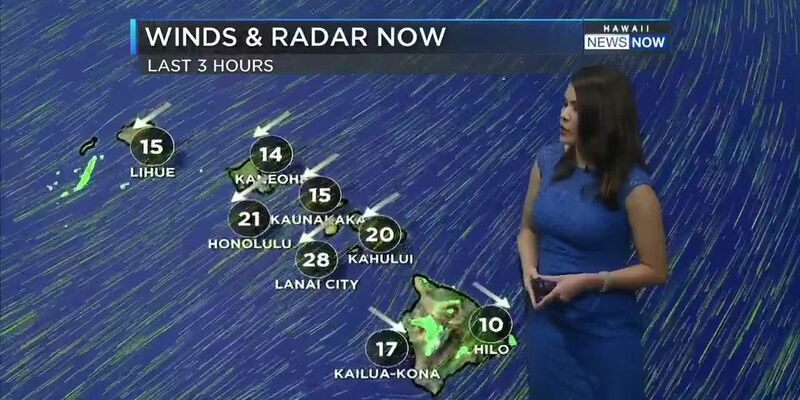 From Thursday onward increasing trade wind speeds, and then another cold front will bring clouds and showers to the islands on Saturday and Sunday. Strong trade winds will arrive behind the cold front. For mariners: A Small Craft Advisory (SCA) remains in effect for all waters through tonight, and this will likely need to be extended through Tuesday for portions of the marine area due to elevated seas associated with the current large northwest swell, with all areas forecast to drop below SCA levels by Tuesday night. The trades will begin to re-strengthen Wednesday night as a new high builds northwest of the state, reaching moderate to strong speeds once again Thursday through the weekend. 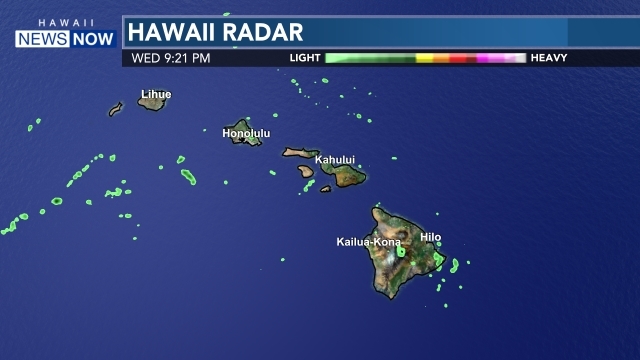 High Surf Advisory until 6 PM HST this evening for Niihau, Kauai Windward, Kauai Leeward, Waianae Coast, Oahu North Shore, Oahu Koolau, Molokai, Maui Windward West, Maui Central Valley, Windward Haleakala. 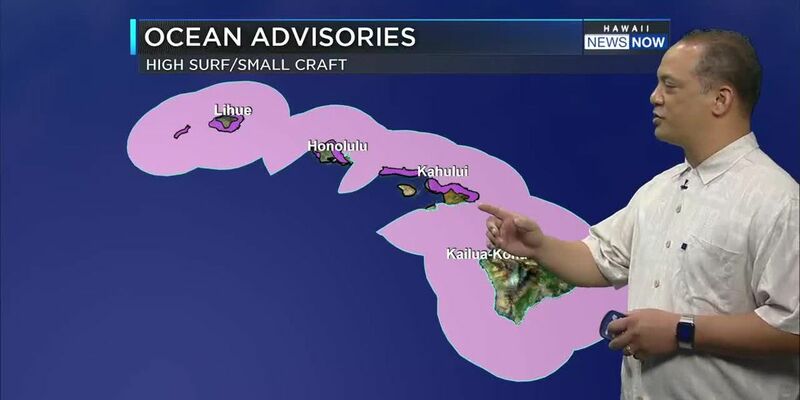 Small Craft Advisory until 6 PM HST this evening for Kauai Northwest Waters, Kauai Windward Waters, Kauai Leeward Waters, Kauai Channel, Oahu Windward Waters, Kaiwi Channel, Maui County Windward Waters, Alenuihaha Channel, Big Island Windward Waters, Big Island Leeward Waters, Big Island Southeast Waters.